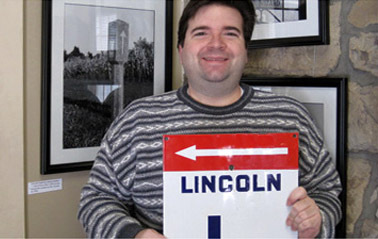 The Illinois Lincoln Highway Coalition proudly announces that partner vendor ShawCraft Sign Company and company president Jay Allen received the second place award in the 2012 International Sign Design Contest presented by Signs of the Times magazine for production of the ILHC Mural Series in the Best Murals/Banners category. 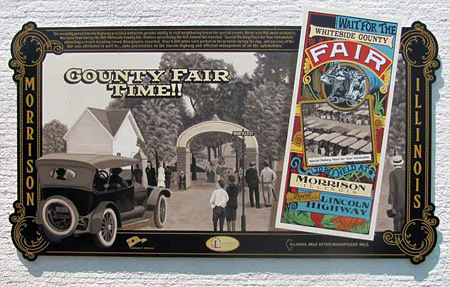 The winning project features the Coalition’s series of large-scale murals designed and fabricated by ShawCraft’s lead designer Jay Allen; each mural is a striking, hand-painted work of public art, communicating the significance and history of the early Lincoln Highway. UPDATE 3/27/12: LHA Vice-President Kay Shelton reports “City Council of Geneva voted tonight not to allow the demolition of the Pure Oil Building.” She spoke there in favor of its preservation. A former gas station along the Lincoln Highway in Geneva, Illinois, may be demolished. An article in the Geneva Patch (and other sources) says the landowner has proposed to replace the 1937 station with a branch of St. Charles Bank at the West State Street site. 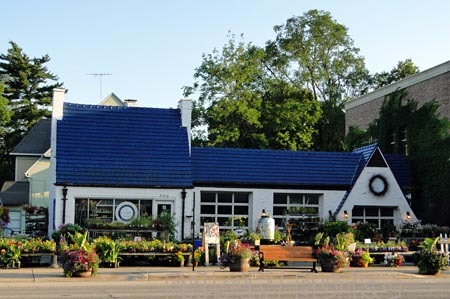 The well-maintained cottage-style station closed in 1995 and has been home to The PURE Gardener since 2006 when former owner and auto repair operator Joe Kuchera sold the building. On one hand, we have a historic building that is shown proudly in Geneva Chamber of Commerce brochures. 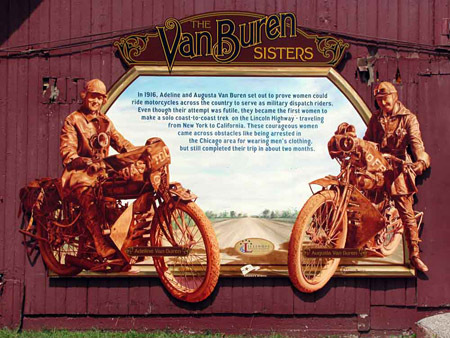 It’s a building style that goes back to the 1930s and one that’s considered a milestone marker of the Lincoln Highway. On the other hand, it’s a former gas station. And the bank’s plans represent new development at a time when the tax base—particularly in downtown Geneva—is shrinking…. The public, always split on such matters, is leaning towards preservation. The writer continued…. But in these economic times, can the city afford to do that? Can any government in good conscience say no to good-faith development in an economy that makes it more and more difficult for anyone to build or expand? The garden center owners who lease the blue-and-white station posted a letter to the editor HERE pleading to save the building. Comments overwhelmingly favor preserving the building because it makes sense, both aesthetically and economically. NOTE: A follow-up article stated that last night, “With the applause of about 50 passionate spectators, Geneva’s Historic Preservation Commission voted 5-1 Tuesday to deny demolition of the former Pure Oil gas station.” But the commission is only a recommending body; the developer can still take the issue to the city’s planning commission and council.